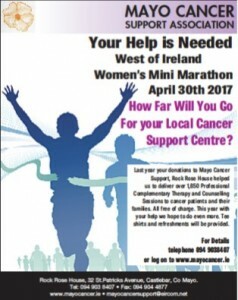 How far will you go for your Local Cancer Support Centre! The West of Ireland Women’s Mini-Marathon takes place on Sunday April 30th 2017. Last year your donations to Mayo Cancer Support helped us deliver over 1,850 Complimentary Therapies and Professional Counselling Sessions to Cancer Patients and their families. This year, with your help we hope to do even more. T-Shirts and Refreshments will be provided.